Established in 1993, Al Muzammil Recruiting Agency is being run by the tram of highly professionals, competent and skilled administration personnel’s on the sound commercial lines to cope with normal situation and in emergencies as well. Over the one and half decade, - Al Muzammil Recruiting Agency has earned a strong reputation and built a domain expertise in the human resources industry. specialized in providing recruitment services for Civil Construction, Civil Engineering, Electromechanical (Specially all types of Welders, Fabricators, fitters), Gas, Oil and Petrochemical, Hospitality, IT Industry Skilled and unskilled Labors. To provide our valuable clients with the right resource for the right job at a competitive cost with expedient response in selection and testing. Placed over 35,000 personnel from Pakistan for opportunities in over Gulf Region. One of the leading, well reputed Government Approved agency of the Pakistan. Our believe is to maintain quality services of the clients. 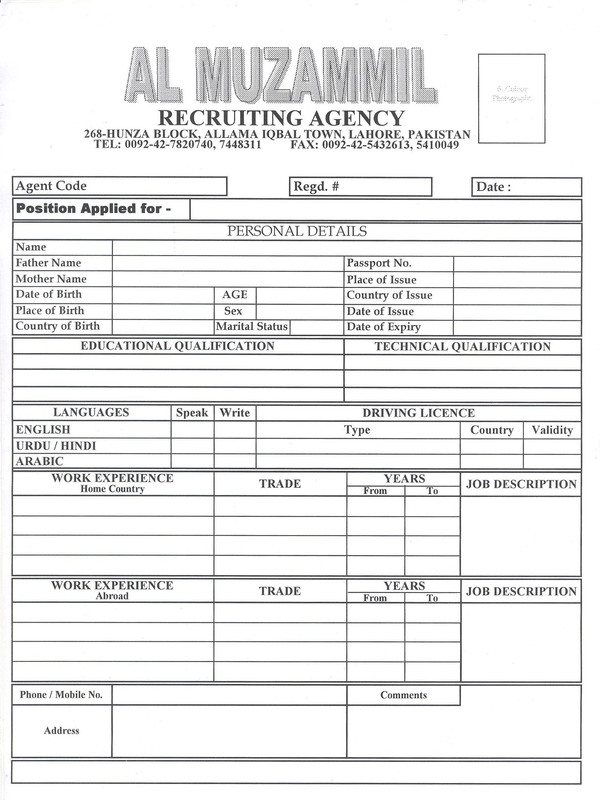 Replacement Guarantee for those candidates who do not meet clients expectation for any reason. Brilliant sense of picking the right person for the right job. Professional management plays an integral role in all projects and ensures that the best resource are located for the clients. A team of highly professionals competent and skilled Administration Staff. High quality and cost effective services. Combined strength of team enables effective pre-screening and interviews of candidates for almost any position or trade. With over one and half decades of experience in the manpower industry. Shows ability to meet the standard and highest level of satisfaction.